Oregano is one of the most popular herbs around the world, and it's preferred by gardeners because of its resilience and easy care. Although oregano is a hardy, adaptable herb, it prefers well-drained, sandy soils and requires very little watering, characteristics that make it an ideal aromatic herb for any home garden. Like other aromatic herbs, oregano is easy to care for, and if it is grown in containers, it can be kept indoors during the winter, so it can provide its fresh fragrance and flavor all year around. These easy to follow growing guidelines will help you to succeed in the cultivation of this culinary and medicinal herb. Make sure the soil contains enough organic matter. If it doesn't, it can be added in the form of compost. Plow the soil thoroughly and deeply enough using a gardening rake to allow for adequate development of the root system and good drainage. If planting in pots, it is preferable to loosen the soil in sandbags before pouring it into each pot. Although oregano does not demand many nutrients and compost will feed it the whole growing cycle, in poor soils, the application of a fertilizer may be considered in order to enhance growth and development. Water the soil heavily and then let any excess water drain before planting. Oregano can be grown from seeds or cuttings. However, as sometimes seeds may not germinate, cuttings can be taken from fully-grown oregano plants. If planting seeds, it is recommended to soak them in water beforehand in order to increase the germination rate. Place seeds on top of the growing medium and press them into the surface. As they need plenty of light to germinate, just cover them slightly with sifted soil. If planting in pots, place one seed per pot. Keep moist without over-watering. For planting in garden soil, mark rows separated eight inches (20 cm) from each other and sow a seed two inches (5 cm) deep every eight inches (20 cm). Seeds can also be planted in an uninterrupted row by drawing a line two inches (5 cm) deep along the row and pouring in the seeds continuously. Then, cover slightly. After one week, the seeds should have already germinated. They can be transplanted at this stage to another sunny spot if desired. Oregano doesn't need a lot of water. Grab a handful of soil and squeeze it to make sure it is moisturized. If the soil is dry, give a light sprinkling to prevent it from drying out. Remember, oregano does well in light soils, which tend to dry out fast, and it is also susceptible to root rot from excessive watering. Oregano is low-demand in terms of nutrients, and adequately-prepared soil should provide enough for the plant's development. In soils with a low content of organic matter, NPK fertilizer can be applied. It will provide nitrogen, phosphorus, and potassium. It is recommendable to apply half of the recommended dose before planting and the second half after pruning in the soil surrounding the neck of the stem. Be aware that excessive fertilizer can reduce the flavor of oregano leaves. Nutritional deficiencies may manifest as retarded growth, light-colored leaves, yellowish spots, tips on the leaves, or any other similar sign that could be a response to a lack of certain nutrients. Those deficiencies can be remediated by applying a liquid micronutrient corrector, preferably by spraying it over the leaves. Using disinfected scissors, eliminate stems growing laterally in order to direct development towards the production of new leaves. Keep in mind that allowing oregano to flower will reduce or stop growth completely. It also reduces the flavor of the leaves. Oregano, like other perennial herbs, will die to the ground at the end of each growing season and return the next year from the roots. In order to help them survive the cold season, a winter mulch of evergreen boughs or straw can be applied in November or December, after the soil has frozen, and be removed in the spring. On the other hand, many oregano varieties that grow in pots are able to spend the winter indoors. Although oregano is a very hardy herb, it can be attacked by aphids and spider mites. Root and stem rot may occur in the presence of fungi, usually due to excessive watering or poor drainage. Always check for plants with retarded growth, as well as any parts that differ from the standard or that are gathering large populations of insects. Never use scissors that were used on plants showing disease symptoms for pruning or harvesting healthy plants, and consider removing infected plants from the area. It is preferable to harvest oregano when it has reached five inches (12.5 cm) tall and before it flowers in order to obtain the highest concentration of phytonutrients in the leaves. Harvest on warm days, after the morning dew has dried, to obtain the highest concentration of essential oils. Use scissors to cut the stems with a node or set of leaves to ensure the sprouting of new stems. After harvest, let the leaves dry indoors at room temperature or freeze them while fresh. 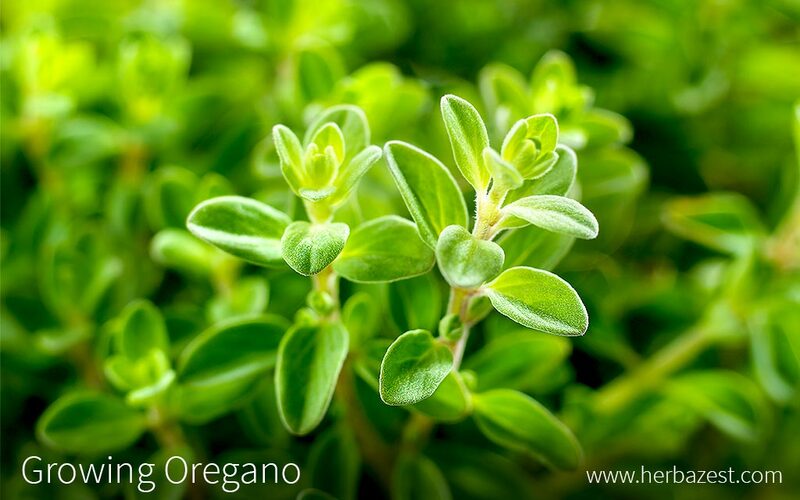 Since oregano doesn't contain much water, it will not ripen after being harvested. It is better to consume stored oregano before the next harvest, since the concentration of its active compounds will fade away as time passes. Unlike most herbs, oregano leaves are best used dried.